Google Analytics is the most popular tool for any online marketer, but it’s not always the easiest resource to use. There are thousands of Google Analytics Report options but they break down into just four main categories: audience, acquisition, behavior, and conversions. 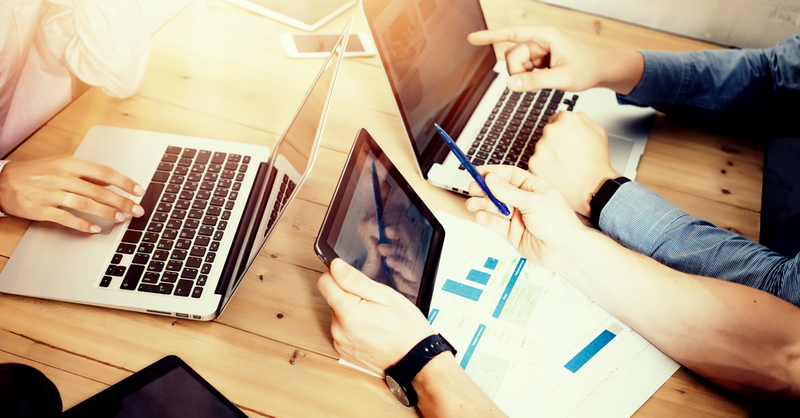 You’ll want to use a sprinkling of essential reports in each of these areas regularly to help you make better decisions on enhancing your online presence. But, which ones are most vital to your success? 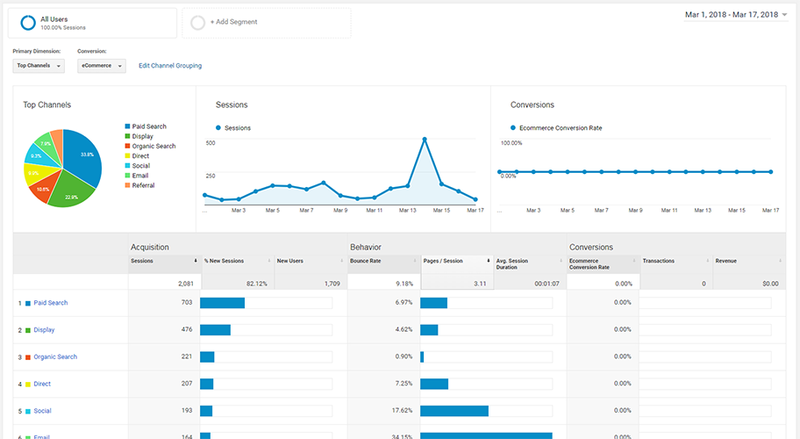 Beyond the Keyword Analysis Report, which is an absolute must for any Google Analytics user, these are the reports you’ll want to use regularly to get the full benefit from this powerful resource. Landing Pages is the key behavior-related report you’ll want to check early and often, especially if your marketing effort relies to a considerable degree on ads on landing pages. Landing pages are, by design, where your potential customers first come into contact with your website. You need to know how well each of these is performing. If a page is meant to be an introduction to your online store and it’s sending people away, you’ll want hard data to help you improve it. The Landing Pages report helps you with just this sort of information. This Google Analytics report lists your landing pages in order of popularity, indicating key data like the number of visits, average visit length — and what percentage of visitors “bounce” from a given page without browsing at your site any further. Bounce rate, as we’ve already learned from the Landing Pages report above, measures the percentage of potential buyers who land at a page at your site but take no further action. Exit rate, on the other hand, measures the number of your site visitors who do in fact browse other pages — then decide to leave your site. By comparing this ratio for each of your pages in Google Analytics, you’ll know which ones are welcoming and which are a big turn-off. That should give you helpful clues on how to do less discouraging of visitors, and more persuading them to buy from you. We all want people to visit our online site, and we’re expending considerable time, energy, and money to get them to do so. When they do, especially at increasing rates, it indicates our efforts have been successful. But, there’s one thing we want that’s even better than a new visitor: that visitor returning to our site at a later time. 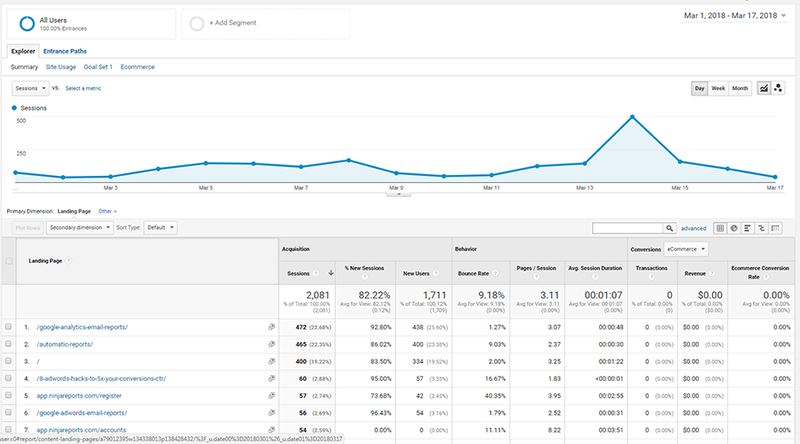 This Google Analytics report tells you how many of your new visitors are coming back to your site. You can then compare this rate to your aspirations — or results of your competitors in general — and make adjustments as indicated to increase the number. Returning visitors are typically the ones who become customers at some point — generally after first read our content and elect to follow our future activity. 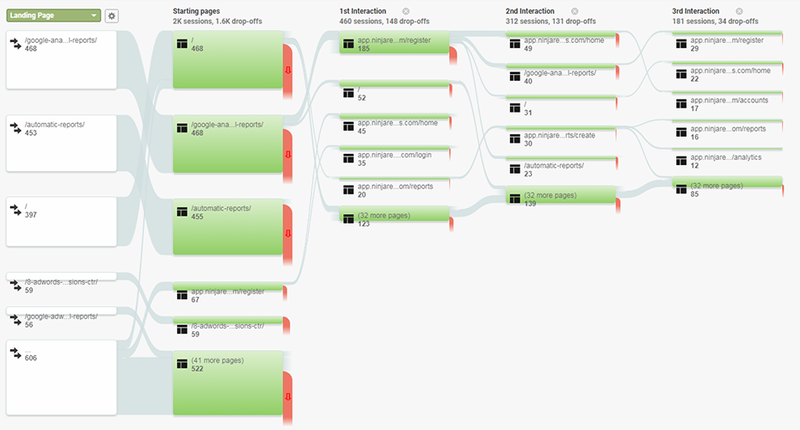 The Behavior Flow report presents you with a visualized flowchart that shows you the exact path visitors take when journeying through your site. It tells you what steps they take, which pages they jump from and to, and what they do after events — e.g., user interactions with your content like downloads, ad clicks, or video consumption. Why should you care about behavior flow at your site? Because you’d like to be able to influence decisions potential customers make when they come to your site. You want to know if they’re going to the pages you want them to. Are they engaging in the way you wish? If not, you now have some useful information you can use to help them behave in ways that are more to your liking. Growing the quantity of traffic to your site, while enhancing its quality, can have an enormous impact on your objectives: generating leads, converting visitors to customers, and making sales. To see how this critical metric is progressing, you’ll want to be regularly checking an overview of your traffic to identify strengths and weaknesses in traffic sources. 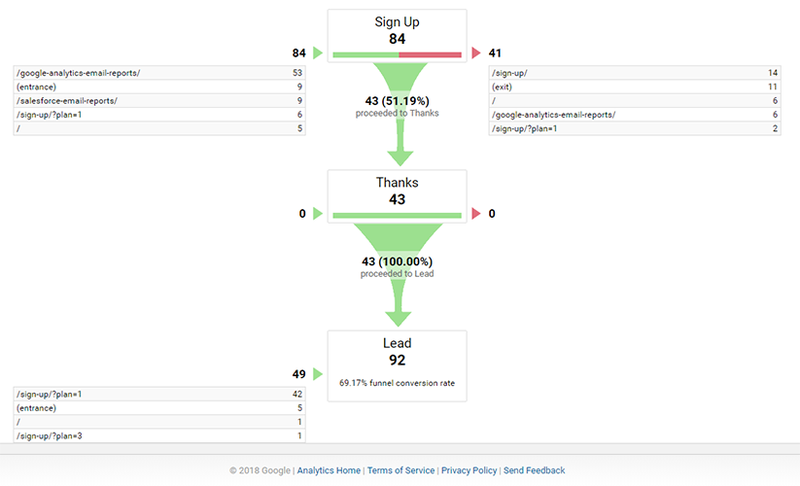 You can do this simply, by using Ninja Reports to send daily Google Analytics email reports. How are your email campaigns performing? How is your paid search investment working? Is your search engine optimization effective? Are people clicking on your ads? Was that guest post on your blog worth the investment? This standard report helps you get answers to these essential questions while getting a handle on the key gearing that drives these crucial indicators in your Google Analytics Reports. If you are generating a bunch of content at your site, you are going to want to know how efficient it is in advancing your goals. Google has just the expert-created report for you. Let the Content Efficiency Report help you answer key questions you have about how well your content is performing by tracking entries, views, exits, and most importantly, completion of the goals you’ve set. You want to know not only which content is most engaging to your future buyers, but what types of content perform best. Should you place more images, GIFs, or infographics? Which combinations of content types lead to the highest number of shares? This report helps you get these answers. You may have a beautiful website with all the bells and whistles in place, but if your visitors aren’t making it through our “flow pages” to sign-up or checkout, you may as well shut it down. The Funnel Visualization report helps you see how they’re making it through the maze you’ve set up. It gives you a heads up on problem pages where the process is breaking down. You’ll be able to zone in on pages with a high drop-off rate to see how you can enhance performance. As a bonus, be sure to arrange for reports to arrive in your inbox automatically — daily, weekly, or monthly. Whatever you do, don’t miss out on the benefits of using the Analytics Solutions Gallery, particularly if you’re new to the game of analytics. Import amazing reports created by analytical geniuses into your dashboard. You’ll be the envy of everyone in your field.